What's creepy to one person can be lifesaving to another: Boston Children's Hospital teamed up with Hollywood special-effects artists to create lifelike simulators to train surgeons on complex, high-stakes operations. Two new trainers are under development and were unveiled at the hospital's Pediatric Innovation Summit in Boston. These will join Surgical Sam and other simulators. 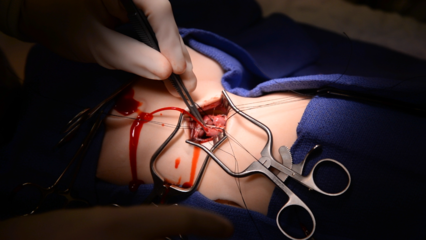 A new neurosurgical trainer focuses on a type of brain surgery to relieve life-threatening swelling, while the other is for heart-lung bypass on newborns. "The current training model, if you call it that, for the patients is the patients," said Dr. Peter Weinstock, the director of the Boston Children's Hospital Simulator Program. By making the simulators more lifelike, Weinstock said, there's more emotional buy-in from the surgeons. "[It's about] being able to hit a level of realism that allows them to fully suspend disbelief and completely engage in the surgery or the procedure," he said. The simulators are more forgiving, not in anatomy, but in the fact that a wrong move would not be fatal. The simulators aren't completely passive. A series of tubes and sensors connect to the "pupeteering room," where the trainers control the simulators and present doctors with the kinds of complications they might encounter in a real surgery. The Hollywood special effects studio that worked on the simulators has experience designing effects for television dramas like "ER" and "The Knick." "We're known for creating hyper-realistic effects, but the difference is now we have to fool a surgeon," said Justin Raleigh, the CEO of Fractured FX. Raleigh said that the simulators are built from actual CT (computerized tomography) scans from anonymous medical records. That makes them as lifelike as possible. Unlike the effects for television, the simulators need to not just look real, but feel real. "We have to make sure it is anatomically correct and has the level of 'tactileness' and the level of density that real tissue would have," he said. The simulators are refillable in that part of them is permanent and other parts are modular and consumable. So after one simulation, a section of the trainer is disposed of and a new one is dropped in for the next try. Weinstock said that the next steps for the project are to complete trials at Boston Children's Hospital and then eventually commercialize the simulators so that other doctors and hospitals could use them. He wouldn't say how much they will cost.